YourSpace App – Forgot Your Password? Here’s How to Reset It! It happens from time to time, you create a great password and then forget it. 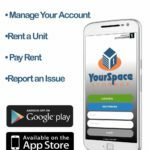 Have no fear, you can still access the YourSpace Storage app! Watch the video below to learn how.